Behind the Scenes: Mustaches + Elephants | Sew Lindsay, Sew! Here are the final measurements that I went with… I really liked the final size and will stick with these measurements when I make this quilt in the future! Keep in mind that these are just the measurements that worked for me, so let me know if you have any additional suggestions or methods that work for you. Once I had that work behind me, piecing the rows together went really fast. I didn’t have to waste time fretting about where each square was supposed to go. And if I ever make this same quilt in the future – 48 squares with 4 different fabrics – I’ll be able to use the exact same layout. I love the way this quilt turned out and will definitely be making it again in the future! With my next rag quilt, I’ll be sure to take lots of photos throughout the process so I can create a tutorial of my own. 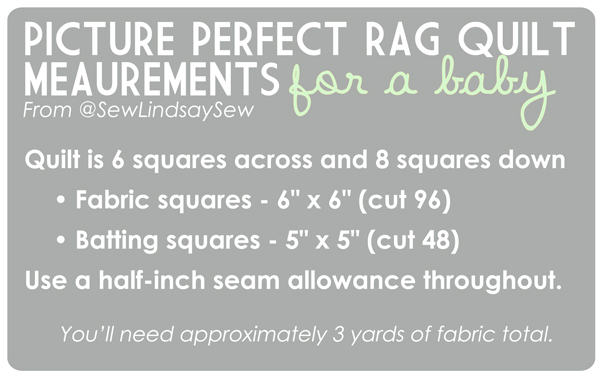 Please let me know if you have any baby quilt measurements that have worked for you – and leave a comment if you decide to give these measurements a whirl. I would love to see your finished products! Pingback: Mustaches + Elephants | Sew Lindsay, Sew! 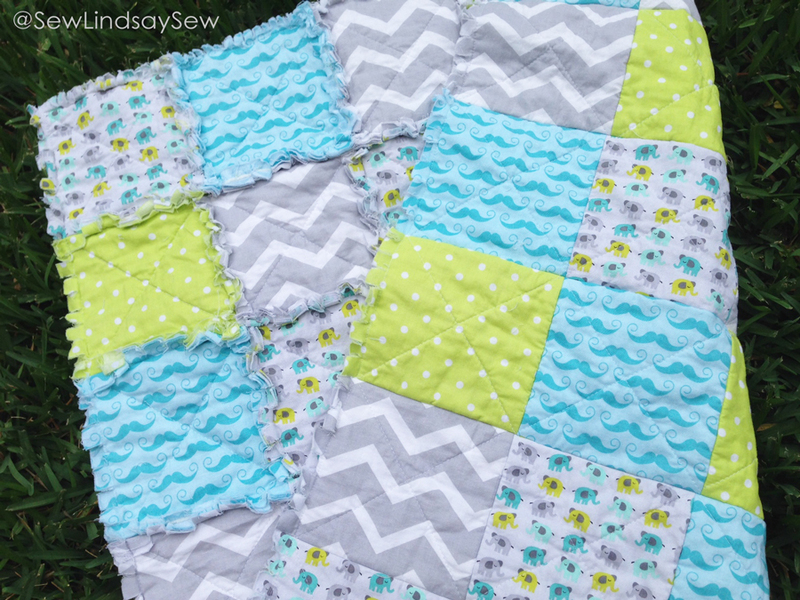 Pingback: A rag quilt for Baby B | Sew Lindsay, Sew!